The aim of this study was to retrospectively study survival and long-term morbidities of children with nasopharyngeal carcinoma (NPC) treated by induction chemotherapy and concurrent chemoradiation (CRT). The total dose of radiation was adapted to the response following neoadjuvant chemotherapy. Children with non-metastatic NPC treated in France between 1999 and 2015 were retrospectively included in the study. The strategy combined neoadjuvant platinum-based chemotherapy, followed by adapted CRT to tumor response. In total, 95 patients (median age 15 years [range, 7–23 years], male-to-female ratio 1.8) with undifferentiated NPC were included; 59% of patients had TNM stage IV. Intensity-modulated radiotherapy (IMRT) was delivered to 57 patients (60%), while the other patients were treated with conformal RT (3D-RT). After a median follow-up of 4.5 years [range, 3.6–5.5 years], 13 relapses and seven deaths had occurred. The 3‑year overall and relapse-free survival (RFS) were 94% [95% CI, 85–97%] and 86% [77–92%], respectively. The locoregional failure rate was 6% [95% CI, 2–14]. Long-term treatment-related sequelae of grade 2+ were reported by 37 (50%) patients; odynophagia was significantly reduced treated by IMRT vs. conventional 3D-RT (7% vs. 55%, p = 0.015). Using a reduction dose of 59.4 Gy, 54 Gy, and 45 Gy, respectively, to the primary, involved, and uninvolved neck nodes, after a favorable tumor response, was not associated with an increased locoregional failure rate. The survival rates for NPC have been considerably improved by means of multimodal therapy, but long-term locoregional morbidity remains common. Use of IMRT may induce less residual odynophagia. Radiation dose reduction adapted to chemotherapy response does not have a negative impact on outcome. These findings support the use of an RT protocol adapted to the tumor response to neoadjuvant chemotherapy for a long-lasting improvement in the patient’s quality of life. The online version of this article ( https://doi.org/10.1007/s00066-019-01461-6) contains supplementary material, which is available to authorized users. Retrospektive Analyse der Überlebenszeit und der Langzeitmorbidität von Kindern mit Nasopharynxkarzinom (NPC), die mit neoadjuvanter Chemotherapie und zeitgleicher Chemoradiotherapie (CRT) behandelt wurden. Die Strahlendosis wurde an die Reaktion auf die neoadjuvante Chemotherapie angepasst. Kinder mit nichtmetastasiertem NPC, die zwischen 1999 und 2015 in Frankreich behandelt wurden, wurden retrospektiv in die Studie eingeschlossen. 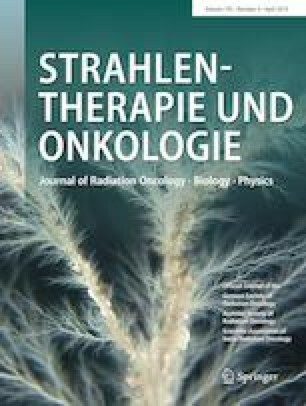 Die Behandlungsstrategie bestand aus einer Kombination von neoadjuvanter platinbasierter Chemotherapie, gefolgt von einer an das Ansprechen auf Chemotherapie angepassten Strahlentherapie. Fünfundneunzig Patienten (mittleres Alter 15 Jahre, Spanne7–23 Jahre; Verhältnis Männer/Frauen 1,8) mit NPC vom Typ III konnten in die Studie eingeschlossen werden; 59 % der Patienten hatten ein TNM-Stadium IV. Bei 57 Patienten (60 %) wurde eine intensitätsmodulierte Strahlentherapie (IMRT) verabreicht, während die anderen Patienten mit einer konformen RT (3D-RT) behandelt wurden. Nach einer medianen Nachbeobachtungszeit von 4,5 Jahren (Spanne 3,6–5,5 Jahre) traten 13 Rückfälle und 7 Todesfälle auf. Die 3‑Jahres-Gesamtüberlebensrate und die rezidivfreie Überlebensrate (RÜR) betrugen 94 % (95 %-Konfidenzintervall [KI] 85–97 %) bzw. 86 % (95%-KI 77–92 %). Die regionale Rückfallrate betrug 6 % (95 %-KI 2–14). Langzeitfolgeerscheinungen von Grad 2 oder höher traten bei 37 Patienten (50 %) auf; Odynophagie war bei Patienten, die mit IMRT behandelt wurden, im Vergleich zu herkömmlicher 3D-RT signifikant reduziert (7 % vs. 55 %; p = 0,015). Die Verwendung einer Reduktionsdosis von 59,4 Gy, 54 Gy bzw. 45 Gy für die primären, betroffenen und nichtbetroffenen Halsknoten nach günstiger Tumorantwort war nicht mit einer erhöhten lokoregionalen Ausfallrate verbunden. Die NPC-Überlebensraten konnten durch eine multimodale Therapie erheblich verbessert werden; eine lokoregionale Langzeitmorbidität besteht jedoch nach wie vor. Das IMRT-Verfahren kann zu einer Verringerung der Odynophagie führen. Die an das Ansprechen auf Chemotherapie angepasste Dosisreduktion hat keinen negativen Einfluss auf die Überlebensraten. Diese Ergebnisse unterstützen die Verwendung eines RT-Protokolls, das an das Ansprechen auf neoadjuvante Chemotherapie angepasst ist, um die Lebensqualität des Patienten nachhaltig zu verbessern. The French Fracture database is supported by the “Enfants, cancers et Santé” association who did not take part in any analyses of this study. We thank Dr G. Schleiermacher for the editorial assistance. A. Jouin, S. Helfre, S. Bolle, L. Claude, A. Laprie, E. Bogart, C. Vigneron, H. Potet, A. Ducassou, A. Claren, F.G. Riet, M.P. Castex, C. Faure-Conter, B. Fresneau, A.S. Defachelles, and D. Orbach declare no actual or potential conflict of interest including any financial, personal or other relationships with other people or organizations that could inappropriately influence (bias) their work.